No press tickets. No Palace Radio. No reason to be there other than to enjoy the game solely as a fan. I admit I had forgotten what being a fan felt like after so long watching every move and needing to come up with something witty to say or an observation to jot down. For once I had the chance to just live the moment of the football match and when the whistle went the pressure was off. Of course I miss reporting on games so much. The connections I had built up at various publications for football were the first to go or withdraw their support in the way of work and even though I am better now the offers do not roll in like they used to. It is clear mental health stigma is still very much alive in the footballing world. Returning to Selhurst involved almighty courage from myself as an acknowledgement of the past v the present. It was made additionally challenging by being in the Lower Holmesdale because normally I just hide away somewhere with a little desk and space galore. My anxiety is still there and being surrounded by people, standing for 90 minutes and trying to remember all the words to various songs was a lot of pressure. But I did it because December is the month of me doing stuff instead of letting fear win out to prepare that mentality for the year ahead. My partner got the tickets through one of his workmates season tickets because neither him or his dad were heading to the game. Getting hold of gold dust is easier than getting hold of a Palace ticket these days! The day was great and I felt so good afterwards. The uplifting feeling of cheering with everybody around you feels great and it stays with you for the rest of the day and weekend. I felt alive, proud of myself and most importantly had a good time enjoying Palace football as a fan; the way it is meant to be enjoyed. I could go on to do a huge thing about what I thought of the game but I was there to enjoy it and not get a match report out of it. We won and it was a miracle (given how the scoreline did not really reflect our poor first half performance) and it was nice to be able to see the team succeed in person (or succeed at all in Palace’s recent case). 3-0 against a team on a run of form is not too shabby at all let us just see if we can keep it up away at Hull! 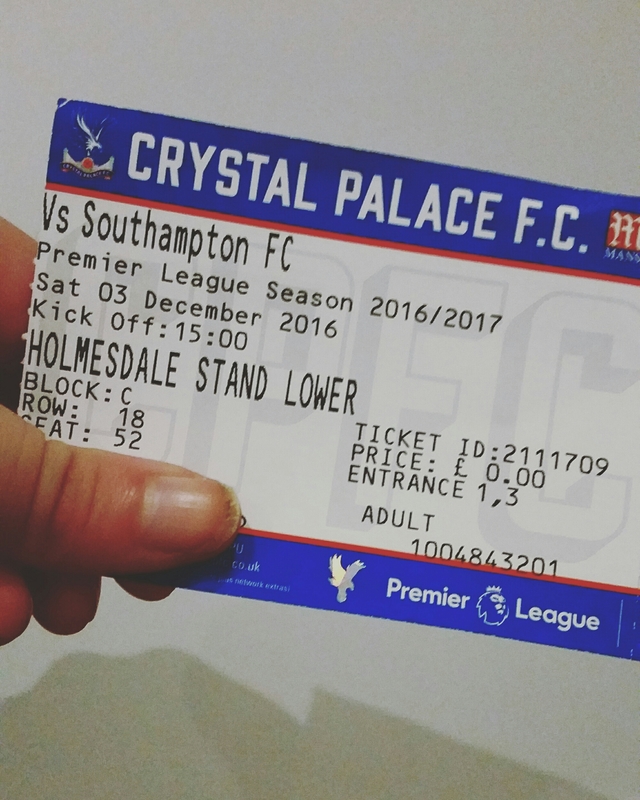 This entry was posted in My Life, Sport and tagged 3-0, blogmas, cpfc, crystal palace, enjoyment, fan, football, holmesdale, journalism, lblog, lblogger, lbloggers, life, Lifestyle, lifestyle blog, lifestyle blogger, lifestyle bloggers, live, living, Mental Health, mental health stigma, palace radio, premier league, press box, reporting, season ticket, southampton, Sport, sport blog, sport blogger, sport bloggers, sports, sports blog, sports blogger, sports bloggers, success, win, winning. Bookmark the permalink.